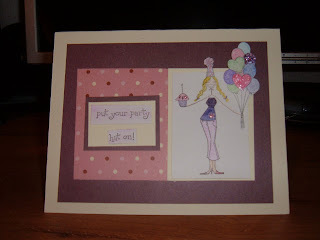 I recently came across Stamps, Scraps n more challenge blog. This weeks challenge was to use your bella stamps. I don't have any bella stamps I have been lucky enough to have receive a few images from swaps and RAK's (Random Act of Kindness). I made this card. I cut the idea of cutting around her balloons and party hat from Prairie Paper & Ink (but mind didn't turn out as nice as hers). Now that I'm really getting to my hobby more I'm going to invest in a decent set of markers or pencils, any suggestions?? The basic layout of the card came from a sketch from Card Inspired by Maria (I do apologize I printed out the sketch, I can't locate it on her blog now, I will look again later). I put stickles on several the hats, bella's scream stickles to me. Cute! Prism pencils are great, they blend easily. I am not a big marker fan as I can't color anything in with out it looking like markers. I hear SU have good ones though. I really want to try water color pencils. I love the look. Hope that helps! Sorry for the double post, not sure what happened.